For better or worse, the gluten-free, wheat-free, and grain-free diet movements are en vogue right now. Sure, some of us adhere to one version or another of these diets for medically justifiable reasons. But a whole lot of other people are jumping on the bandwagon just because. And books like Wheat Belly, Grain Brain, and Gluten: Zero Global aren’t helping any. Poor wheat has been horribly maligned, blamed for everything from hangnails to brain cancer and everything in between. Anti-wheat and anti-grain evangelists try to convince anyone who will listen that gluten, wheat, and/or grains (take your pick, depending on your preferred level of specificity) are responsible for all manner of health evils, and that purging them from your diet will bring upon us a Second Coming. I’m here to say enough already! Don’t get me wrong… If you’re one of the people who has regained your health through the power of diet, whether motivated by one of the aforementioned books or not, great. I’m fully in support. But enough with the “if it’s true for me it must be true for all humanity” brainwashed thinking. Just because purging a food from your diet sparked a miraculous health turnaround for you doesn’t mean that it’s the root of all evil and that we should banish said food (aka gluten, wheat, grains) from the face of the Earth. The bold claims and promises being made by certain best-selling authors and bloggers reek of snake oil. If it sounds too good to be true, it probably is. And the claims aren’t hard to debunk. In fact, they’re so straightforward to disprove that it’s almost laughable. Yet they continue to perpetuate and permeate the gluten-free community. Go ahead and click on that graph above to see a full-size version. Study its details. Then come back here and keep reading. One of the most common claims you hear is that eating gluten/wheat will make you fat and sick, and the more of it that you eat the fatter and sicker you get. Simple enough, except that the claim evaporates upon even cursory scrutiny, and it’s easy enough to put to the test. My graph above includes a dozen countries. The UN classifies them all as “developed nations,” which I used a proxy for affluence and socio-economic status. I further chose only European nations or nations of predominantly European descent (e.g., United States, Canada, Australia), as a proxy control for similar genetic background. Then I pulled national obesity data from the Food and Agriculture Organization of the United Nation’s recent 2013 The State of Food and Agriculture Report. Next I grabbed per capita wheat consumption for those same countries from the most recent available data from FAOSTAT. The data speaks for itself. The U.S. is by far the most obese nation of the group, with 31.8% of the population classifying as obese (Mexico only last year overtook the U.S. as the most obese developed nation worldwide), yet every other country in the group consumes as much or more wheat than we do … with far lower rates of obesity. Countries such as Greece and Italy consume an astounding 75% more wheat per capita than we do, yet their national obesity rates are 45% lower than the U.S. Meanwhile, countries such as Denmark and France consume about 25% more wheat than Americans, yet have obesity rates half that of us. How is it that nations with similar levels of affluence and genetic predisposition can eat so much more wheat than Americans yet have such profoundly lower rates of obesity? Answer: because gluten, wheat, and grains are not the dietary Rosetta Stone. For some of us, yes, avoiding them unlocks manifold health benefits. But it’s unfair—and inaccurate—to make wheat a scapegoat. The story is exactly the same if you pull World Bank data for life expectancy for the countries in my graph. In theory the more wheat you eat, the sicker you get, and the sicker you get, the sooner you die. But that’s not what happens at all. Countries that eat far more wheat than us live healthier, longer lives than we do. It would be convenient if the truth was as simple as “It’s the wheat, stupid.” But it’s time we move beyond such naive and overly simplistic thinking. Enough already. Long-time reader here. Not sure if I’m gluten sensitive or not (the Paleo craze got me thinking about all this stuff back in 2009). 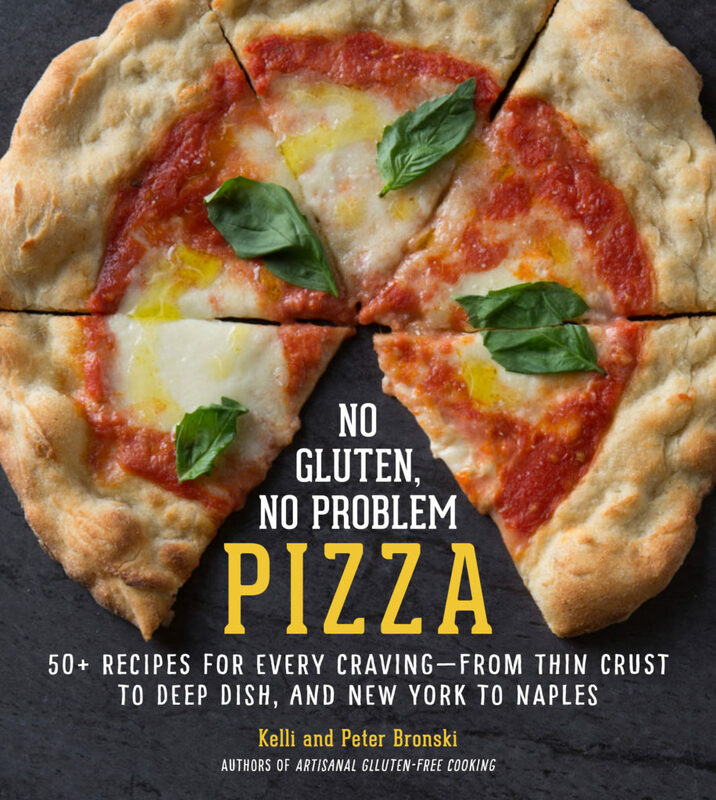 Don’t think I have a problem with wheat, but I have to tell you, your pizza crust recipe in Artisanl Gluten Free is my go-to for the whole family, we love it. Thought you might appreciate it in light of your post. As for worsening health and the “obesity epidemic” my money is on excess sugar and an unfavorable Omega 3:Omega 6 ratio in our diets (hello, Crisco). Unless you have celiac or GS or some other condition where eliminating gluten or all grains from your diet, something else is up and blaming gluten/wheat is a red herring. Thanks for this excellent blog and the great recipes. PS Congrats on the birth of your son. Be careful! That third one pushes you over the edge 🙂 18 months later I’m still clinging by my fingernails. Wild ride though, lots of fun. Enjoy it! According to some of the top scientists in the field, none of us break down and utilize gluten. But — that doesn’t mean it’s detrimental to everyone. Some people tolerate it just fine, others can’t deal with it at all (me). But to zero in and blame wheat (or all grains) on obesity, dementia, and a host of other diseases is undermining the real issue of gluten intolerance. There are so many variables to the obesity epidemic and each person is different. If someone does better not eating grains, great! But to pin every evil on wheat is starting to turn “gluten-free” into a joke and that’s not good. Loved the chart. Great research (I’m not surprised), nice perspective, and good writing. Hope all is well with you and your growing family! Oops, I’m not “Anonymous” — just a bit quick with the “publish your comment” button. 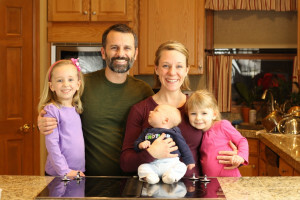 Thanks Pete – I was actually told by a health care professional that wheat had caused all my health issues, and I must be getting cross-contamination if not everything in my health and life were solved by eliminating gluten. It isn’t just books perpetuating the untruths. There was a lot of “wheat can cause that, that, that, and that” – well, based on medical research there are plenty of possible causes – not just wheat. Thank you for saying all this! I try to tell people this myself but for some reason, they think that because I have celiac, I am “anti-wheat”. I’m not, nor do I think wheat is the cause of what’s making ALL people sick. I saw this journal article recently and thought it pretty much bolsters your thoughts as well. Congrats on your new family member! Thanks for all you and your family do for the GF community. 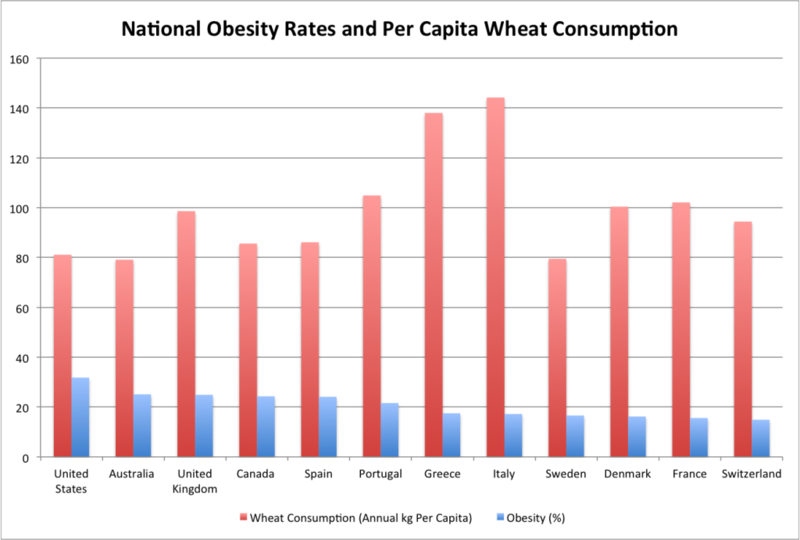 It’s not just wheat, but total carb intake which seems to correlate to obesity levels in various countries. Wheat, as a type of carb (which also happens to cause damaging inflammation in people), contributes to the weight gain process — regardless of the percentage of the countries’ total carb intake it happens to be.